Kalk Bay is a suburb of Cape Town, which started out as a fishing village on the False Bay coast. It has a protected harbour from which local fishermen launch their wooden boats. From around midday the boats start returning and offloading their catch – you can buy your supper straight from the boat. The narrow main street is full of quaint shops and galleries selling antiques artworks and bric-a brac. There are several good restaurants in and near to the harbour. Up on the mountainside above are walks and the well known Kalk Bay caves. A photograph taken in the harbour inspired this painting. 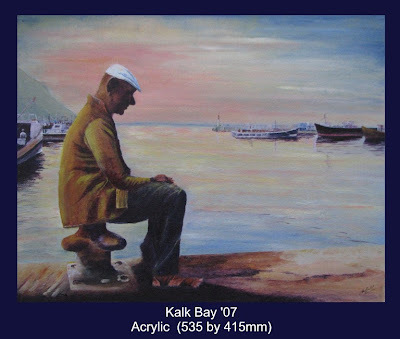 Haven't been to Kalk Bay for many years. Beautiful there.